Recently, Hong Kong researchers published a review article ‘Eczema therapeutics in children: what do the clinical trials say?‘ in Hong Kong Medical Journal. Categorized by major treatment methods, previous clinical trials were examined for each individual treatment option. Below is my quick and dirty summary, for the full paper that is available for free, see here. I hope I don’t look like a crazy mom charging my eczema daughter to shower after swimming! sites such as axillae and groin. Potent fluorinated corticosteroids should be avoided for infants and sensitive skin areas. Systematic reviews of studies that compared the frequency of application of newer-generation moderately potent to very potent steroids identified no benefit in outcome for more frequent applications over once-daily application. >> Keep to once a day, no more than twice. Topical corticosteroids are generally safe with few serious reported adverse effects. Risks of side-effects increase with higher potency, occlusion, thinner skin areas, severity of eczema, young age and longer duration of use. >> Be careful if your usage falls into these categories! 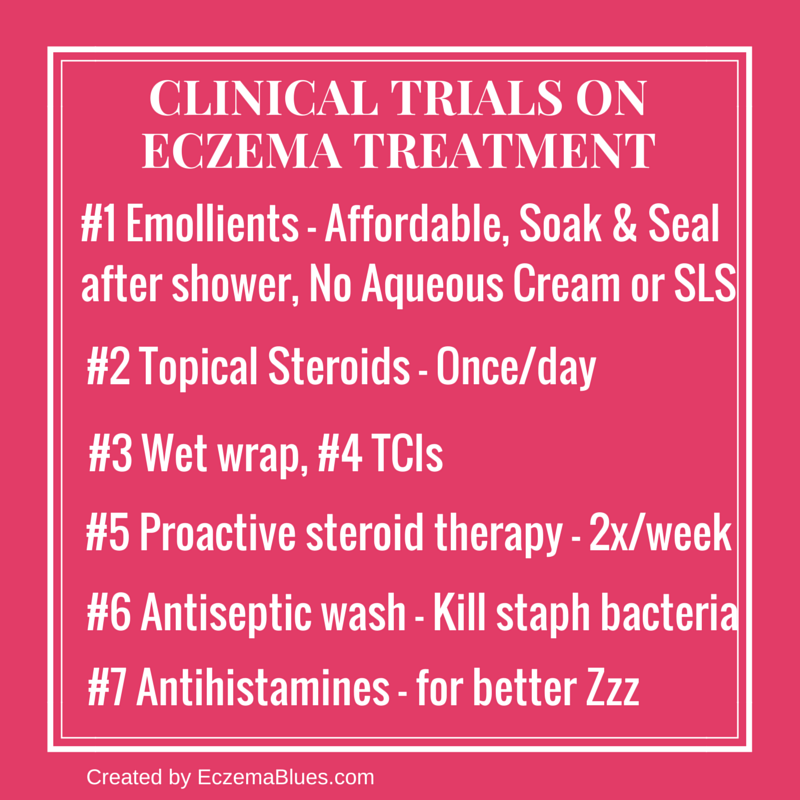 All studies reported improvement in eczema scores, though the methods of wet wrap vary, for e.g., some used diluted steroid + moisturizer while another used chlorhexidine + moisturizer. folliculitis more commonly caused by ointment. There is strong evidence that TCIs have a steroid-sparing effect and long-term use up to 12 months can prevent flares. Topical calcineurin inhibitors are particularly useful for sensitive sites including the face, neck, and skin flexures. It’s now studied that there is no statistically significant cancer risk. The results suggested that for a patient with moderate-to-severe eczema and chronic relapsing lesions, maintenance treatment with topical anti-inflammatory therapy twice a week may be a better strategy to prevent eczema flares and topical corticosteroids more effective than topical calcineurin inhibitors. The rationale is that there is inflammation in the underneath layer of skin that is not visible, ie has not presented itself as rash. Bacteria count was reduced and there was significant improvement in mean eczema EASI (Eczema Area and Severity Index) for those using diluted bleach bath. >> I use chlorhexidine-wash for my daughter with eczema twice a week. More research news on bleach bath here. There is no strong evidence that oral antihistamines are effective anti-pruritics. They are safe to use and their sedative effects, where present, may be useful to promote better sleep quality. More treatment options that are less often prescribed are covered in the review article, like oral medication. Read up and let me know what you think!